Our timber decking is of the highest quality softwood timber, it is available in a variety of lengths from 1.8m to 4.8m. The width is 120mm and the depth is 28mm (minimum size after machining), the timber is responsibly sourced and is pressure treated. The stylish but classic profile will suit any size garden and design. Using decking boards gives the customer the flexibility to create additional living space and/or a low maintenance but usable space. Not sure how much timber deckboard you need telephone or e-mail your enquiry over and we will work out what materials required for your project. Don't forget to order your joists and fixings for the support structure of your decking area. 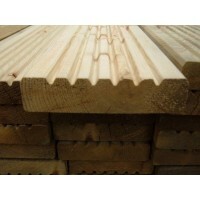 TJ's timber deckboard is of the highest quality and is manufactured from Swedish redwood £2.00..